What do Brazilian and Indian Internet users have in common? A favorite social networking site called Orkut, a Google web property which, when it was launched in 2004 was meant to put its parent company on the social networking map in the U.S. Orkut may not have taken off stateside, but it has exploded in these two countries, and it isn’t alone. Pioneering social networking site Friendster saw U.S. usage wane with the appearance of MySpace, but has experienced exponential growth in Southeast Asia. It’s a phenomenon which has left company leaders scratching their heads about where all the users came from and what to do with them. The global nature of the Net means that a service launched in one country might well catch fire in another one across the world. U.S. Internet users are more likely to move to the newest, shiniest service rather than join a network and stay put — leaving an opening for new users in another land. Perhaps the success of these sites overseas is due to the loyalty of the other markets to the product, and a testament to their ability to mobilize their friends to join the service they love. Here’s a rundown of some of the more popular “Made in the USA” social media sites that are hitting it big overseas. Like its gigantic cousin MySpace, Orkut is a rather modest, almost antiquated-looking website with much the same features as other social networking services. It doesn’t have all the bells and whistles of some competitors, but when it first entered the Brazilian collective conscience in 2004, Orkut (pronounced “oh-koo-chee” in Portuguese) quickly became a social phenomenon. 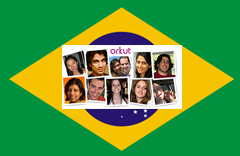 Now over 58% of Orkut’s users are Brazilian and, according to Alexa, Orkut is the most popular site in Brazil. Brazilian tech blogger Daniel Duende talked to me about how social networking in Brazil really took off in the summer of 2004, and about how his countrymen — very social people — “took over” Orkut and made it Brazilian. He says that part of the success of the site among Brazilians can be attributed to timing. Orkut is so imbedded in Brazilian culture that it has even inspired a tongue-in-cheek song of betrayal and love lost called “I’m going to delete you from my Orkut” (“Vou te deletar do meu Orkut”). Composed by an Orkut user, the song quickly made its way across the network and, because of the reach of Orkut, across Brazil. Soon there were hundreds of people doing their own videos for the song on YouTube, which has received broad media attention across the country. Because social networking is so popular in Brazil, some experts have called it the perfect testing ground for new sites and a way to gauge the future popularity of these services. But Duende says Brazil is Orkut territory, and there are really no other players in the space that could possibly compete with it. “Friendster came too early, and they were too ‘cold’ in their approach to web social networks,” he said. And while MySpace is already widely used in Brazil (and has plans to launch a Brazilian version soon), Duende says Orkut is ingrained in Brazilian society. “Orkut is part of the lives of more than half our Internet users, and an important part of our Internet history,” he says. Brazil isn’t the only country that’s crazy about Orkut. While more than half of Orkut’s users are based there, and the U.S. takes second place at nearly 19%, a close third is India at over 15%, where the site is stirring debate and causing political furor. The Hindu Nationalist Party, Shiv Sena, is demanding that Orkut be banned due to its “immoral” content, and some of its crusaders have even gone so far as to ransack cybercafes. Nonetheless, Orkut still enjoys massive success in India. According to Alexa, Orkut beats Google in terms of traffic in India, ranking as the No. 2 most popular site in the country, after Yahoo. It’s not only straight social networking sites which have been “taken over” by Brazilian users. A New York City-based photo-sharing site called Fotolog.net owes much of its success to Brazilians who have made the site their own. While social photo-sharing king Flickr enjoys a diverse international user base — as evidenced by its move this week to offer translated versions of the service in seven languages — Fotolog’s popularity practically began in Brazil. According to Fotolog CEO John Borthwick, 90% of Fotolog’s user base is located outside of the United States, and Brazil was the starting point which later led to growth in the rest of South America, eventually spreading to Europe. As with Orkut, many Brazilians are fiercely devoted to Fotolog, and have found innovative uses for their site profiles, experimenting with the service as a platform for creative expression. Daniel Duende cites the case of Brazilian fashion designer Marimoon, who began her career by posting photos of her designs on the site, and now successfully markets her creations on the Internet. 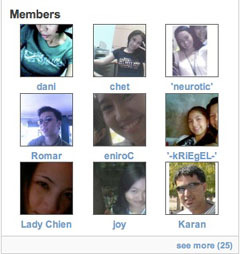 Back in 2003, before the dawn of the MySpace era, Friendster was king. But as MySpace began to gain ground, Friendster saw traffic drop as people migrated to the new kid in town. By 2004 Friendster seemed to be out of fashion in the U.S., but as its popularity plummeted here, it was on the rise in Southeast Asia. In a recent article in Inc. magazine, Friendster’s director of engineering Chris Lunt says the Asian Friendster phenomenon seems to have started in the Philippines, where the site still enjoys amazing traffic. Lunt wondered why Friendster’s web traffic was spiking in the middle of the night, and noticed that the traffic was coming from the Philippines. According to Inc., he worked backwards, looking for “patient zero,” the first American who linked to a Filipino, and found Carmen Leilani De Jesus, a marketing consultant and hypnotherapist in San Francisco. She connected to dozens of Filipinos, and eventually more than half the site’s traffic was from Southeast Asia. 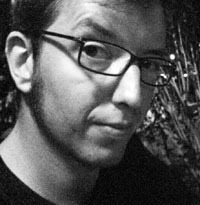 Lunt’s “oh no” moment was undoubtedly related to the fear that the “American-ness” of the network might be tainted by the massive influx of foreigners, and the fact that Filipino Internet eyes are of little value to American advertisers, who are looking for local consumers to whom they can sell their wares. The Filipino Friendster phenomenon might have started with one user, but what makes it so attractive to Filipino users? I asked prominent Filipino tech blogger Abe Olandres what he thought and he told me it was all about timing: “It was the first mover in social networking in the country, and before that, nothing came close to it except for forums or message boards,” he said. De Jesus, the American who helped bring Friendster to the Philippines, believes the service’s popularity is due to the culture of friends-helping-friends in that country. Friendster is now alive and well in the Philippines and even enjoying mainstream popularity. Just as U.S. presidential candidates are using MySpace and Twitter to build social networks of supporters, Filipino politicians are using Friendster to reach younger folks. Olandres says that mid-term local elections in the Philippines last May brought Friendster to the political arena when Senatorial candidate Chiz Escudero (now a Senator) used his profile to bolster the support of thousands of Filipino users. The Wall Street Journal published an article last week about the Filipino Friendster phenomenon and the growing pains the company has had with the appearance of their accidental market. Some say that Friendster’s popularity in Asia — in addition to the appearance of MySpace on the scene — is what killed the site here, while others think that this new market represents Friendster’s second chance to make it. While some sites fail in the U.S. and triumph elsewhere, there are others that enjoy both strong local and international user bases. One of those sites is Hi5, a social networking service launched in 2003, which boasts a staggering 60 million registered members. While Hi5 has a significant number of U.S. users, the bulk of its traffic comes from Europe and South America. Hi5 CEO and founder Ramu Yalamanchi told me that the rapid growth and international success of Hi5 can be traced to an early decision to look beyond the U.S. — something that other American social networking sites didn’t consciously do. “No one really knew if social networking would become a global phenomenon, but we’ve had an open approach to international markets from the beginning,” he said. Hi5’s approach has worked quite well for its business, as it became profitable just a year later with revenue coming entirely from advertising. While Friendster might have originally seen its international user base as unattractive in terms of money-making, Hi5 has found a way to make advertising profitable for them in each of their international markets by establishing partnerships with local companies, such as Portugal Telecom in Portugal and EType in the UK. Yalamanchi says that once you are in the Top 5 most popular websites for any country, selling ad inventory in those countries is seamless. And Hi5 is in the Top 5 for a number of markets, both in Europe — in Portugal it’s No. 1 — and Latin America. No one really knows why, but Hi5 has become extremely popular among Latin Americans and Latinos in America. It’s the No. 1 or No. 2 site in most of Central America, and ranked in the Top 5 in most South American countries. In the U.S., as the Latino online population grows with no real social networking destination of its own, Hi5 is poised to serve that need. 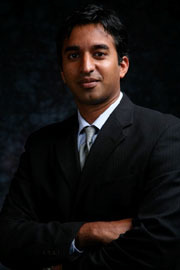 Yalamanchi says there’s room to grow in the U.S. Latino market, as well as in the markets where Hi5 already dominates. With that in mind, in 2006 the company translated the service into seven languages and has enjoyed an increase in membership as a result of their localization efforts. The appeal of Hi5 might lie in its no-nonsense, simple approach to social networking. Even without taking into account language, it’s easy to get in and start networking quickly because of the accessibility of its user interface. And while the site still remains simple, the company has begun to invest in more localized features to further cater to its global user base, such as localized search for 70,000 cities. Only on the Internet can we see a product developed and brought to market with one group of people in mind, only to hit it big with an entirely different audience in another part of the world — in what seems like an accidental way. With the influx of new and unexpected international users, social networking services have been forced to reconsider their relationships with users and the features they offer. No longer are they dealing with a market they already know, but they are now struggling with unknown cultures and, in some cases, languages. Hi5 honcho Yalamanchi says he believes the key to success in this business is welcoming the newcomers while still keeping your original target audience’s interests at heart. That’s a fine line to walk, and some seem to be doing it better than others. What do you think? Why are certain sites a hit in foreign countries and less successful in the U.S.? What is it about these various cultures that might lend themselves to a certain type of social networking site? Can you think of other online services born in America that hit it big abroad? Share your thoughts in the comments below. the thing with social networks is that its like the next big fashion craze. you’re only in it depending on who else is wearing that shirt. though friendster was the first mover in the PH, i believe that other services such as multiply and pretty soon, facebook will be dominant players as well because more and more filipinos are joining the bandwagon. friendster doesn’t offer competitive (read: useful) services as facebook and Multiply. online stalking is made easier by these two services as compared to friendster as you can view those who viewed your profile by default on multiply, as well as track all associations with your friends of friends of friends on facebook. also, i found it weird that multiply didn’t come up in the interview for PH-favored social networking services. what does this mean? i guess it means that the westerners arent aware of that phenomenon because it was overshadowed by myspace and facebook. multiply is most useful especially since it provides an easy way to download music, albeit raising eyebrows on copyright issues (in the PH, multiply is the new bit torrent). However, growing beyond is challenging. A multi-lingual interface is a first must, but there’s more to it. A network of local community managers for example. I feel that EU-based companies (Hi5, Netlog,…) succeed more in opening up to countries beyond Western Europe and the US. Orkut is a rare odd example. I think Daniel has a very good point that the Brazilian rush towards Orkut and Fotolog was a matter of timing. Besides, Google (and everyt Brasilian knows Google = Orkut) did (and does) enormous efforts to maintain a ‘sympathic’ image amongts Brasilians; including local offices and spokesmen (and lawyers). Consider me a fan of your scribbles from now on ! Thank you for such a complete view of social networking sites. I believe that the race is long and we are only at the beginning. MySpace got a great headstart, but there is much room for improvement. And as time goes on, social networking will become more and more focused, not necessarily on language or nationality, but on ideas, lifestyles, etc., etc. MyGrito is a social networking site as well. We describe ourselves as a center of communication, information and entertainment for our community (the Latino community). But if you look as us, we are a fusion of youtube and myspace. Our alexa.com ranking is already at 20K in the US, 85K worldwide, so we like to believe we’re doing something right. By the way, we just launched our political page, Tu Grito 2008. Check it out y pon tu grito. Anyway, I just wanted to say, gracias for the article. These sites are inspirations, and lessons, for small sites like ours. Thanks for mentioning Hi5. We’re mostly unknown in the US, but that’s starting to change. I believe that the reason why Hi5 is the most popular in Latin America its because it is the only networking web on the internet most people know about. I can tell you from my experience. I went to college in the US and I used Hi5 to connect with my exclassmates. Then I invited some of my costa rican friends, and one by one they started joining. They dont have any clue what myspace is, much less facebook. They dont even know what the word facebook means, but they know me well. A new and versatile social networking site in the planet where you can customize your profile, upload photos, create your own blogs, post and watch videos, and chat with your friends live, all in one stop. It truly is a social networking site that connects YOU to the world. What is the most lucrative Internet business that has a low start-up cost? Hi wanna make lots of money?? ?well here is your chance… read this and you will know what i am talking about trust me all you have to do is be honest and follow every step and before you know it you’ll start getting money… I started out with $6. Now, I am making thousands. I found this on a bulletin board and decided to try it. A little while back, I was browsing through newsgroups, just like you are now, and came across an article similar to this that said you could make thousands of dollars within weeks with only an initial investment of $6.00! So I thought, “Yeah right, this must be a scam”, but like most of us, I was curious, so I kept reading. Anyway, it said that you send $1.00 to each of the 6 names and addresses stated in the article. You then place your own name and address in the bottom of the list at #6, and post the article in at least 200 newsgroups. (There are thousands) No catch, that was it. So after thinking it over, and talking to a few people first, I thought about trying it. I figured: “what have I got to lose except 6 stamps and $6.00, right?” Then I invested the measly $6.00. Well GUESS WHAT! ?… within 7 days, I started getting money in the mail! I was shocked! I figured it would end soon, but the money just kept coming in. In my first week, I made about $25.00. By the end of the second week I had made a total of over $1,000.00! In the third week I had over $10,000.00 and it’s still growing. This is now my fourth week and I have made a total of just over $42,000.00 and it’s still coming in rapidly. It’s certainly worth $6.00, and 6 stamps, I have spent more than that on the lottery!! Let me tell you how this works and most importantly, WHY it works… Also, make sure you print a copy of this article NOW, so you can get the information off of it as you need it. I promise you that if you follow the directions exactly, that you will start making more money than you thought possible by doing something so easy! Suggestion: Read this entire message carefully! (print it out or download it.) Follow the simple directions and watch the money come in! It’s easy. It’s legal. And your investment is only $6.00 (Plus postage) IMPORTANT: This is not a rip-off; it is not indecent; it is not illegal; and it is 99% no risk – it really works! If all of the following instructions are adhered to, you will receive extraordinary dividends. PLEASE NOTE: Follow these directions EXACTLY, and $50,000.00 or more can be yours in 20 to 60 days. This program remains successful because of the honesty and integrity of the participants. Please continue its success by carefully adhering to the instructions. You will now become part of the Mail Order business. In this business your product is not solid and tangible, it’s a service. You are in the business of developing Mailing Lists. Many large corporations are happy to pay big bucks for quality lists. However, the money made from the mailing lists is secondary to the income which is made from people like you and me asking to be included in that list. Here are the 4 easy steps to success: STEP 1: Get 6 separate pieces of paper and write down your name and address followed by the words “PLEASE ADD ME TO YOUR MAILING LIST” on each of them. Now get 6 US $1.00 bills and place ONE inside EACH of the 6 pieces of paper so the bill will not be visible through the envelope (to prevent thievery). Next, place one paper in each of the 6 envelopes and seal them. You should now have 6 sealed envelopes, each with a piece of paper stating the above phrase, your name and address, and a $1.00 bill. What you are doing is creating a service. THIS IS ABSOLUTELY LEGAL! You are requesting a legitimate service and you are paying for it! Like most of us I was a little skeptical and a little worried about the legal aspects of it all. So I checked it out with the U.S. Post Office (1- 800-725-2161) and they confirmed that it is indeed legal. Mail the 6 envelopes to the following addresses:(1) (Kaho Mohamed 3042 Blaisdell Ave Minneapolis MN USA 55408) (2) (Andrew Closser 15 Adams street Easthampton MA USA 01027) (3) (Galal AlSafey 44 Beacon Terrace Springfield MA USA 01119) (4) (Hazel Hulse 25 Plum Street Springfield MA USA 01109) (5) (Chane Closser 36 Beacon Terrace Springfield MA USA 01119) (6) Charles Claybrooks, P.O. Box 578, Milwaukee, WI, USA 53203) STEP 2: Now take the #1 name off the list that you see above, move the other names up (6 becomes 5, 5 becomes 4, etc…) and add YOUR Name as number 6 on the list. STEP 3: Change anything you need to, but try to keep this article as close to original as possible. Now, post your amended article to at least 200 newsgroups. (I think there are close to 24,000 groups) All you need is 200, but remember, the more you post, the more money you make! You won’t get very much unless you post like crazy. This is perfectly legal! If you have any doubts, refer to Title 18 Sec. 1302 & 1341 of the Postal lottery laws. Keep a copy of these steps for yourself and, whenever you need money, you can use it again, and again. PLEASE REMEMBER that this program remains successful because of the honesty and integrity of the participants and by their carefully adhering to the directions. Look at it this way. If you are of integrity, the program will continue and the money that so many others have received will come your way. NOTE: You may want to retain every name and address sent to you, either on a computer or hard copy and keeps the notes people send you. This VERIFIES that you are truly providing a service. (Also, it might be a good idea to wrap the $1 bill in dark paper to reduce the risk of mail theft.) So, as each post is downloaded and the directions carefully followed, six members will be reimbursed for their participation as a List Developer with one dollar each. Your name will move up the list geometrically so that when your name reaches the #1 position you will be receiving thousands of dollars in CASH!!! What an opportunity for only $6.00 ($1.00 for each of the first six people listed above) Send it now, add your own name to the list and you’re in business! —DIRECTIONS —– FOR HOW TO POST TO NEWSGROUPS———- Step 1) You do not need to re-type this entire letter to do your own posting. Simply put your cursor at the beginning of this letter and drag your cursor to the bottom of this document, and select ‘copy’ from the edit menu. This will copy the entire letter into the computer’s memory. Step 2) Open a blank ‘notepad’ file and places your cursor at the top of the blank page. From the ‘edit’ menu select ‘paste’. This will paste a copy of the letter into notepad so that you can add your name to the list. Step 3) Save your new notepad file as a .txt file. If you want to do your postings in different settings, you’ll always have this file to go back to. Step 4) Use Netscape or Internet explorer and try searching for various newsgroups (on-line forums, message boards, chat sites, discussions.) Step 5) Visit these message boards and post this article as a new message by highlighting the text of this letter and selecting paste from the edit menu. Fill in the Subject, this will be the header that everyone sees as they scroll through the list of postings in a particular group, click the post message button. You’re done with your first one! Congratulations…THAT’S IT! All you have to do is jump to different newsgroups and post away, after you get the hang of it, it will take about 30 seconds for each newsgroup! **REMEMBER, THE MORE NEWSGROUPS YOU POST IN, THE MORE MONEY YOU WILL MAKE! BUT: YOU HAVE TO POST A MINIMUM OF 200** That’s it! You will begin receiving money from around the world within days! You may eventually want to rent a P.O. Box due to the large amount of mail you will receive. If you wish to stay anonymous, you can invent a name to use, as long as the postman will deliver it. **JUST MAKE SURE ALL THE ADDRESSES ARE CORRECT. ** Now, each of the 5 persons who just sent me $1.00 makes the MINIMUM 200 postings, each with my name at #5 and only 5 persons respond to each of the original 5, that is another $25.00 for me, now those 25 each make 200 MINIMUM posts with my name at #4 and only 5 replies each, I will bring in an additional $125.00! Now, those 125 persons turn around and post the MINIMUM 200 with my name at #3 and only receive 5 replies each, I will make an additional $625.00! OK, now here is the fun part, each of those 625 persons post a MINIMUM 200 letters with my name at #2 and they each only receive 5 replies that just made me $3,125.00!!! Those 3,125 persons will all deliver this message to 200 newsgroups with my name at #1 and if still 5 persons per 200 newsgroups react I will receive $15,625,00! With an original investment of only $6.00! AMAZING! When your name is no longer on the list, you just take the latest posting in the newsgroups, and send out another $6.00 to names on the list, putting your name at number 6 again. And start posting again. The thing to remember is: do you realize that thousands of people all over the world are joining the internet and reading these articles everyday?, JUST LIKE YOU are now!! So, can you afford $6.00 and see if it really works?? I think so… People have said, “what if the plan is played out and no one sends you the money? So what! What are the chances of that happening when there are tons of new honest users and new honest people who are joining the internet and newsgroups everyday and are willing to give it a try? Estimates are at 20,000 to 50,000 new users, every day, with thousands of those joining the actual internet. Remember, play FAIRLY and HONESTLY and this will really works! THIS WORKS ALL AROUND THE WORLD. WHERE EVER YOU ARE, YOU CAN MAKE MONEY..!! seriously, most people think this is a scam, but you actually do get thousands of dollars out of it, it is NOT another stupid scam,if people follow through with sending out $6, it works!!!!! By the way, please DON’T try to deceive people by posting the messages with your name in the list and not sending the CASH to the rest of the people already on the list, you will NOT get any. This is the fairest and most honest way I have ever seen to share the wealth of the world without costing anything but our time!! !You also may want to buy mailing and e-mail lists for future cash. Make sure you print this article out RIGHT NOW! Also, try to keep a list of everyone that sends you CASH and always keep an eye on the newsgroups to make sure everyone is playing fairly. Remember, HONESTY IS THE BEST POLICY.IMPORTANT: If you’re not interested to my article, (don’t want instant cash? ), please pass this message to anyone who wishes quick money. Thank you so much. Hi jenifer, thank you so much for this excellent analysis. Hi Jenifer, always wondered why my cousins in India were talking about. Thanks for clearing it up! your presentation was very succinct and very much to the point about the social networking phenomenon that has taken the world like a conflagration. Just wanted to point out the existence of a new social networking site called AFRICANATUBE. AFRICANATUBE social networking site is the epitome of knowing oneself and sharing one’s cosmopolitan experiences with others. It’s opened to everyone regardless of race or national origin. Again I laud you for a scrupulous work you have presented here. Thanks!! Thanks for finally explaining what Orkut is about! What does the name actually mean? Indian to the World on orkut is very popular in that he is the most used Myspace … In an Indian but also used more Orkuk vine’m not there because the only girl and the boy can talk. Friends can mean only for a time. face book is like a lot of people because it is a social networking website. I like too facebook, myspace and many social networking website. This is interesting, I was thought that maximum traffic on orkut from India only. Really nice analysis. Orkut may not too much popular in India or South Asia. I hardly hear someone using that in our country Bangladesh. @ Wall art… What are you talking about?? ?